I’ve been asked a few times over the past few weeks about how to make images really big. Luckily Photoshop CC had a feature enhancement a while ago now which is perfect for this job. Let us take this example, below is a picture that i shot at the White Rann of Kutch in Gujarat. One request this week from a UK based Photographer was to upsize to 600cm on the long edge. Let’s have a look and see how this is possible in Photoshop CC. The Image upsize feature is available under the Image / Image Size menu option (marked in Red below). Once the dialog is open, there is an option to choose Bicubic Smoother or Sharper. These can be used depending on if the image was being made smaller or larger. The Automatic option could however, be used and it would select the correct option for you. The new feature that makes such a great job of upsampling is the ‘Preserver Details’ option. This option has been designed to do a much better job at preserving the edge details of an image, that the other options. To upsample this image to 600cm using this feature, it’s as simple as choosing Centimeters and setting this value to 600cm. Photoshop CC, will then run the process, and the result will be the correct size with amazing detail still preserved. The draw back, however, can be the resulting file size. Below, the dialog is reporting an output file size over over 26GB. This will be based on the resolution specified in the image size dialog box. To reduce the final output side, the resolution can be decreased, and the resulting file size will be decreased. You should tune this to be what your system can manage (as it is RAM and disk space dependent). Once OK is pressed, Photoshop CC will work it’s magic and upsize the image. You can see below, the file is now showing a zoom level of 3%, as the image size is quite large. If I zoom in to 50%, you will see the amount detail in the face of the camels owner. You can see in a comparison image of the original file, I need to zoom into 500%, to get the same results. For comparisions and where this can go. I have succesfully upsized a 16mp file to be 72 inches on the long edge (Fuji x-PRO 1), as well as a 50mp file from the new Canon 5DSR to 65feet on the long edge. Having printed these two outputs, i’m pretty sure that a 30cm minimum viewing distance is acheivable once the upsample has be done. Of course, going too large wil increase the file size dramatically. This file in the exercise went to 12GB, the 65feet upscale went to 65GB and would take over 200 sheets of A2 to fully print it. If you are looking to upsize an image, it’s definatly worth giving Photoshop CC a run for a it’s money, as the results are quite spectacular. One operation that is used a lot in Photoshop, especially for photo compositors or matt painters is the Place command. A while ago in an update to Photoshop CC, this command was split into two. Splitting the Place command into two, now enables Photoshop to either Embed an asset (the old way), or to Link to an asset (new way). This post will show the difference of these two features, so you can adopt into your workflow if needed. For the exercise, i’m going to first embed a 144mb file into it, then link to the output PSD file and see what the file sizes are for each. To embed the document into this canvas, just choose File / Place Embed and select the file. Once the file is embedded, the layer will look like the one marked in red below, note the symbol on the thumbnail (showing that it’s embedded). To be clear, the embedded document is now part of the document and will increase the file size by the size of the embedded document. If, on the other hand, within the same empty canvas as above, we choose Place Linked and choose the same file. The symbol on the layer (marked in red) becomes a chain, which is denoting the link to the file (not embedded). The file size in this case will only contain the resulting pixels, not the original file. Below shows the difference in file sizes of the two new PSD’s. The benefit of the Linked file approach, is that it will create a vastly reduced final PSD file. Therefore, Photoshop should perform more efficiently as it’s using much less memory. Of course the only issue is when you would like to distribute the files to someone else. The embedded file will contain the referenced file, where the Linked file will not. For the Linked file, Photoshop will show the rasterised version of it, but it won’t be available for edit. If you would like the other person to edit the linked file, then you can choose to ‘Package’ the file from within Photoshop CC. If ‘Package’ is not available on your system, it’s most likely because this new composite is not saved, so complete a save on this document, then choose Package. Choosing Package will ask for a location. Photoshop will then create a folder structure and package the links, as well as the Photoshop document (as shown below). Linked files are defiantly a great improvement in many ways, benefits include, reducing the number of files within a PSD document, improving performance of Photoshop, sending a file to another Creative (both for editing and a non editable approach). Until then we wish you all a very Merry Christmas and we hope that you are taking lots of pictures and maybe receive a few Christmas photographic gifts (even if you have to buy them yourself (i know that i have a few items that i’ll be buying!). This session will look at the essence of the Creative Cloud Photography plan and show where both Lightroom and Photoshop can be used to edit your photographs. The take away for this session is to be able to use both applications seamlessly in your workflow for making even more beautiful pictures. We will be exploring how to edit your photographs using the combination of Lightroom Desktop and Lightroom Mobile/Web. This talk will walk you through how to set up and configure Lightroom Mobile, as well as how it can be used as part of your editing workflow, the presented will provide some hints, tips and tricks along the way. We will focus on using just Lightroom for editing your photographs, offering ideas, tips and tricks for working with your photographs. 3D Printing is taking the world by storm, and this technology is opening up new creative ideas for Photographers. In early 2014 Photoshop CC gained the ability to create/print 3D objects using a variety of printers, materials and services. This talk will walk you through 3D printing in Photoshop CC with examples of how Photographers can embrace it in their work. We all have cameras that are able to create stunning photographs, and many can now record stunning HD /4K quality video too. This session will show how you can import your video clips into Photoshop / Lightroom and use your existing Photoshop skills to edit and create a compelling short film. This session is brought to you in conjunction with Adobe and Datacolor and will provide an end-to-end solution for colour management. We will explain how colour management can easily be incorporated into your workflow from ‘in the camera’, to the screen and finishing at the printer and transform your workflow forever. This session will ensure that you are able to make perfect looking prints every time. Among Eagle Hunters and Nadaams – An Adobe Slate Creation. 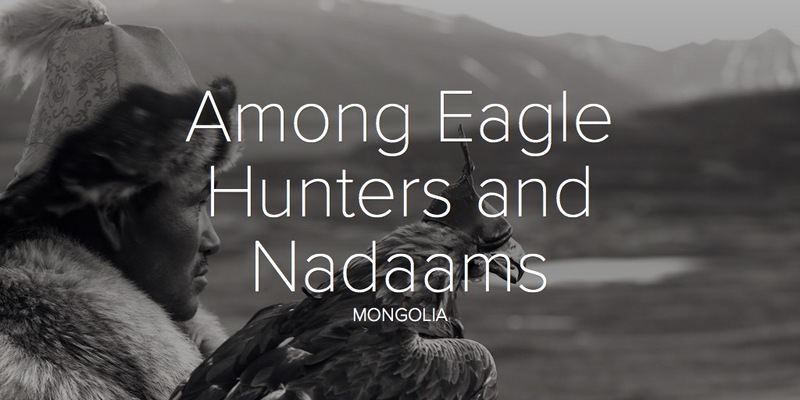 A recent trip to Mongolia sent time with the Eagle Hunters and Nadaams, here is my short portfolio of the trip (All made with Adobe Slate). Why not make your own and see how easy Adobe Slate is to use. Earlier this week Datacolor and I held a webinar on Colour Management as well as the Creative Cloud Photography plan. The main topics of this session were updates from Lightroom CC/6 as well as some of the new Photographic iPhone and iPad apps, including Photoshop Fix, Lightroom. You can watch the webinar on-demand below.